Look. During harvest scouting, carefully examine the roots of unhealthy looking plants and also random plants chosen from around the field. Start in high risk areas, such as field approaches, then fan out in a “W” pattern. By this time of year, galls may start to break-down. Decaying galls will have a sawdust-like look and texture. If in doubt, send plant samples to a lab for identification. How to scout. By this stage of the season, clubroot galls are starting to breakdown, leaving behind a sawdust-like material. Test. 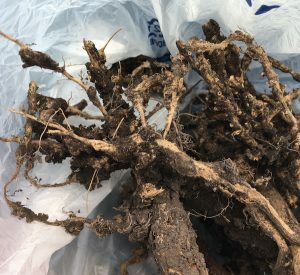 Soil tests to determine if a field has clubroot could be done with just one or two composite samples taken from high-risk areas – like the field entrance or a water run that may bring spores into the field. Labs that do clubroot testing. Clean. Moving soil means moving clubroot. Because more soil clings to machinery in wet conditions, wet harvests will increase the risk of clubroot movement on harvest machinery and trucks. How clubroot spreads. Fields known to have clubroot could be done last to avoid spreading soil to other fields that do not have clubroot. Doing clubroot-infested fields last also means you’ll have more time to give equipment a thorough cleaning before bringing it home. If not doing those fields last, try to knock off as much mud and dust as possible before leaving the field and going to the next one. (No) Tillage. Do not work infested fields when they are wet because more mud will stick to equipment and could be transported to clean fields. Note that fertilizer banding in the fall will move some soil. Growers will want to be conscious of clubroot when bringing in rented applicators and when NH3 nurse tanks are delivered. Perhaps clean the applicator before bringing it to the farm and take nurse tank deliveries at a fixed location at the edge of the field. When choosing a delivery location, perhaps avoid the main field entrance if possible since it will be one of the highest risk areas for potentially spreading clubroot to other fields. Talk. If clubroot is found for the first time, report it to your neighbours and county or municipal office. As noted in discussions at the International Clubroot Workshop, people need to realize that clubroot is the “bad guy” here. Farmers who discover clubroot early and take action should be commended. Read our Top 10 from the ICW.